Eight-year-old Nancy Drew smiled as she sat up straight behind her desk. She loved special guests almost as much as she loved solving mysteries. But who was the well-dressed woman standing next to Mrs. Ramirez? Nancy’s best friend Bess Marvin tugged gently at Nancy’s reddish blond ponytail. “Who do you think she is, Nancy?” she whispered. Nancy was lucky to have both of her best friends in her class. Her other best friend, George Fayne, sat a few desks down. She was too far to trade whispers but close enough to trade smiles! “Wow,” Nancy said under her breath. Darcy’s was the biggest store in River Heights! “Has anyone here shopped at Darcy’s?” Ms. Franklin asked. Nancy’s hand shot up. Her new back-to-school shoes were bought at Darcy’s. She looked around the classroom to see all hands up. All except Leanne Hudson’s. “You’ve never shopped at Darcy’s?” Ms. Franklin asked Leanne. Nancy got it. Leanne’s parents owned Hudson’s Apparel, a smaller store across the street from Darcy’s. Why would she shop anywhere else? Nancy sat up even straighter. What could it be? Excited whispers filled the room. “What kind of scarecrow?” George asked. Tommy Maron’s hand shot up. “Does Darcy’s sell superhero capes?” he asked. “Uh . . . no,” Ms. Franklin said. Nancy smiled over her shoulder at Bess. A contest! Perfect! Nancy thought. 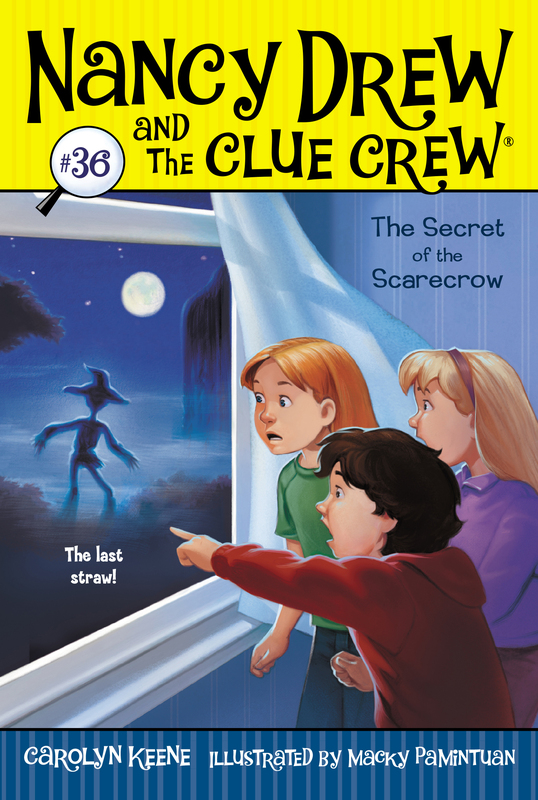 She, Bess, and George were already a team—a team of detectives who called themselves the Clue Crew. “Is everybody ready to make a scarecrow?” Ms. Franklin asked. “Not me,” a voice in the back said. Everyone turned to see Harvey Mueller. “Jake Mc-who?” Kevin Garcia asked. Most of the kids snickered. Harvey was always making up scary stories! Mrs. Ramirez clapped her hands for attention. The kids formed a line near the door. Nancy stood with Bess and George. She frowned when Deirdre Shannon stepped behind her. Deirdre was spoiled and usually got whatever she wanted. What she wanted now was to win the contest! “I heard that, Georgia Fayne!” Deirdre snapped. Nancy watched George’s dark eyes flash. Nobody used her real name except her grandmother—and Deirdre Shannon! The art room had its usual paint-and-clay smell as the class filed in. Nancy, Bess, and George ran to an easel set up with paper and colored pencils. “What should our scarecrow look like?” Nancy asked. “Totally fashion forward!” Bess said. “It’s a scarecrow, not a robot!” Bess argued. Neither could Nancy. Bess had blond hair and blue eyes and loved clothes more than anything. George had dark hair and eyes. She loved computers . . . and clothes, too—as long as they were comfortable enough to do cartwheels in. “Here’s my idea,” Bess said. She quickly drew a scarecrow. Over it she drew a dark red coat, black leggings, yellow boots, and a hat decorated with flowers. When everyone was done, Ms. Franklin checked out the drawings. Nadine Nardo, Kendra Jackson, and Marcy Rubin designed a sleepover scarecrow wearing colorful pj’s. Peter Patino, Quincy Taylor, and Kevin Garcia were proud of their scarecrow wearing sports clothes and sneakers. Next Ms. Franklin checked out Harvey’s sketch. His scarecrow looked just like Jake McStuffings, of course. Leanne’s scarecrow was nothing but a stick figure. Nancy couldn’t wait for Ms. Franklin to check out their scarecrow. But she wasn’t the only one. . . .
“Very nice, dear,” Ms. Franklin said with a quick glance. She then breezed past Deirdre to Nancy, Bess, and George’s easel. “Now we’re designing detectives.” Bess smiled. After the class quieted down, Mrs. Ramirez explained that they would build the scarecrow on Friday before the dismissal bell. That was only three days away! Nancy, Bess, and George didn’t have time for sore losers like Deirdre. They had just won a major contest—and that called for a milk-and-cookie celebration! “Ready? Go!” Hannah called out. The girls giggled as they quickly put down their glasses. They loved playing Hannah’s stop-and-go game when they drank milk with their cookies. Hannah Gruen was more than just the Drews’ housekeeper. She had been just like a mother to Nancy ever since Nancy’s own mom died, when Nancy was three. Hannah gave the best hugs and baked the most awesome oatmeal-raisin cookies! Nancy was about to take another sip when her puppy barked loudly in another room. “What’s up with Chocolate Chip?” Bess asked. “Maybe she doesn’t like being named after a cookie,” George joked. Nancy, Bess, and George found a still-barking Chip in the living room, her paws against the windowsill. “She’s barking at something outside,” Bess said. The girls peered out the window. It was getting dark early. “That doesn’t look like an animal to me,” George said. Nancy looked closer until she saw what George meant. A small, shadowy figure was dancing across her front yard wearing baggy clothes and a big hat! “Who was that?” Nancy said as he ran away.